Not long before the outbreak of World War Two a young British woman, Nona Baker, sailed to Malaya to join her eldest brother, Vin, the tuan besar (general manager), of the world’s largest tin mine. When the Japanese army invaded, Nona and Vin hid out in the jungle with Chinese communist guerrillas - the people who would later become the communist terrorists of the Malayan Emergency. By the time the British surrendered to the Japanese in February 1942, nearly all white civilians had left Malaya - but Nona and Vin stayed on in the jungle. 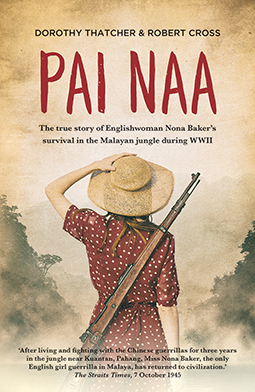 For three years, Nona, now known as Pai Naa (White Nona), the name given her by the Chinese guerrillas, avoided capture by the Japanese and betrayal by spies before at last she was delivered safely into the care of war hero Freddie Spencer Chapman. Pai Naa is Nona’s account her time in the jungle - with her hair cut short she worked alongside the guerrillas, and with the guerrillas she suffered malaria, dysentery, beriberi, hunger and above all, fear. Nona chronicled her experiences with assistance from Dorothy Thatcher and Robert Cross. Pai Naa was first published in 1959. UK-based Monsoon Books has just published a reissue. Since Nona, Dorothy, and Robert are now all dead, Monsoon’s publisher, Phil Tatham, here speaks on behalf of the book they jointly produced, and explains why he republished Pai Naa for a twenty-first century readership. As a publisher of historical memoirs set in Southeast Asia I am always on the lookout for unusual personal tales from the region. Such memoirs act as a form of social history, bringing to life the peoples and traditions, customs and politics of the day, albeit from the cultural standpoint of the author. It is rare for unpublished historical memoirs from the 19th and early 20th century to surface now and we are likely to receive only one or two of these a year, typically handwritten manuscripts rediscovered by the children or grandchildren of a deceased author. There are, however, many wonderful stories that have been previously published and long since forgotten and it is to this rich source of memoirs from 19th- and 20th-century Southeast Asia that we often turn, looking for a tale worth resurrecting. Monsoon is proud of its collection of military memoirs set in 20th-century Malaysia that offer personal views of the three major military conflicts that were staged then, namely the Japanese occupation of Malaya during World War Two, the Malayan Emergency in the 1950s and the Confrontation with Indonesia of the 1960s. Although the people involved in these events are slowly leaving us, there is still a lot of interest in these conflicts from the general public, people with an interest in history and from families of people who were witness to these military actions. Having published quite a few, and read countless more, memoirs set in Malaya I am familiar with many of the important personalities of the time who called Malaya home. The same names crop up in different books and one can trace families and different generations of the same family through the autobiographies of different writers. It was in this way that I came across several references to an Englishwoman, who had purportedly survived three years in the jungle during the Japanese occupation. It must be noted that some of these memoirs were written decades after the wars they describe and the authors are prone to embellishment, so the story of an Englishwoman living for three years in the jungle with communist guerrillas seemed at first to be a little unlikely. However, the name Nona Baker was mentioned in one or two books of the time, including The Jungle is Neutral, by the war hero Freddie Spencer Chapman. We ordered a decades-old copy of Pai Naa from a secondhand bookshop in England and added it to the pile of books and manuscripts to read. After ploughing through a couple of disappointing memoirs we were thrilled to discover that Nona Baker’s memoir was much more engaging, it was well written and it was unique – Nona really is the only documented Englishwoman to have hidden out in the jungle and survived the Japanese occupation. Furthermore, there are very few books describing the lives of the Chinese guerrillas and Nona offers a rare glimpse of this. I knew immediately that this was a book for Monsoon but we then had the task of tracing the family of the author in order to acquire the rights to publish the book. A decade or two ago this was a considerably more challenging task and involved placing advertisements in national newspapers around the world requesting information about the estate of a deceased author, but using the internet it is relatively easy to find people anywhere in the world. We quickly tracked down a great niece of Nona Baker to South Africa and then spoke to the son of Nona Baker’s sister-in-law, himself in his eighties and also living in South Africa. The family was thrilled that Nona’s story would be republished and they supplied another photograph of Nona, taken a decade after she walked out of the jungle. Nona was aided in the writing of her memoir by two others: Dorothy Thatcher and Robert Cross. Although we know little about either person, we were able to trace the estate of Robert Cross via a popular online genealogy website. At Monsoon, we are always looking for historical memoirs that stand out from the crowd and have something meaningful to impart to today’s readers. Nona Baker displays both determination and empathy in her story and she is a fine example of the many incredible women who played such important roles in World War Two. Nona endured severe hardships in the jungle and her health was a constant worry, as were the threats of discovery by the Japanese, or of betrayal by spies. Nona was not a war hero, she was fully occupied trying to stay alive, but she does offer an invaluable account of life behind enemy lines, particularly of the Chinese guerillas who fought the Japanese and would later fight the British as the communist terrorists of the Malayan Emergency. Of related interest: Monsoon has also just reissued A Company of Planters by John Dodd, which was originally published in 2007. 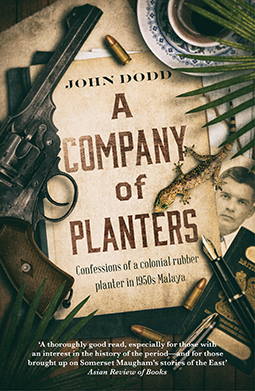 Through a collection of letters written to his best friend and to his father in England, and from his own personal diary entries, John Dodd’s memoir offers a fascinating and amusing glimpse of life as a colonial rubber planter. Details: Pai Naa and A Company of Planters are both published by Monsoon Books in paperback and eBook. Both are priced in local currencies.